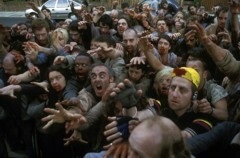 London Is "Zombie Capital Of The World"
london_will London Is "Zombie Capital Of The World"
Just what is going on today? First there's tales of cursed gemstones taking up residence in the Natural History Museum, then we here that a sword factory in west London is closing down and then we discovered the rather alarming fact that we're being overrun by zombies. It's all a bit Dungeons & Dragons. What is even more bewildering is the fact that the second most zombie-laden place in the world is Winsford, Cheshire. Technoworld rather optimistically calls Winsford a "city". Londonist had to look it up. So what in blazes is going on in Cheshire?